With Premier Division supported by Sportsform league leaders Renhold United sitting the afternoon out second place AFC Oakley M&DH will be fully expected to close the gap to just three points when they face strugglers Elstow Abbey. Whilst third place Wilstead who are currently unbeaten in their last seven away outings and on a four game winning run likewise will be expected to collect all three points when they journey to Weston Park to be hosted by second from bottom of the table Eastcotts AFC whose home win tally from 11 outings to date reads just two. Elsewhere over at the Football Centre for fourth place Flitwick Town it’s the quest of home win number four on the bounce when called upon by thirteenth place Sandy who will be seeking their third win on the bounce. Whilst for fifth place AFC Kempston Town & Bedford College it’s a trip to the Green looking to extend their winning league ways up to four games against the hosting tenth place Ickwell & Old Warden. Other action comes at Crawley Road being the venue at which seventh place Cranfield United now on a four game winning home run are visited by third from bottom of the table Caldecote whose only two away wins of the season to date were achieved at the two clubs currently sitting below them in the league standings. Whilst it’s local derby action for twelfth place Pavenham at their Playing Field headquarters against their near neighbours Sharnbrook who sit just one place above them in the league standings. The final top flight action coming at Hitchin Road where sixth place Shefford Town & Campton look to return to winning ways on home soil against the visiting ninth place Marston Shelton Rovers who will be in search of their third away win on the bounce. In Division One supported by Wests Citroen Bedford action for league leaders Sundon Park Rangers the quest will be twofold when they journey to Groveside to face ninth place Henlow. 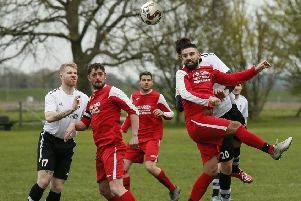 One to retain their seasons unbeaten league ways and two to extract revenge on their hosts who knocked them out of the Centenary Cup just a month ago. Whilst for second place Stevington at their Playing Field headquarters where they are still unbeaten in league action this season the visitors are eighth place Potton Town who will travel in search of away win number four on the bounce to take their current unbeaten ways up to seven games. Elsewhere down at Miller Road third place Meltis Albion will be expected to chalk up league win number four on the bounce when called upon by bottom of the table AFC Oakley M&DH Reserves who are currently on a four game losing run and just across town in Allen Park for fourth place Queens Park Crescents the quest is home win number three on the bounce when called upon by bottom of the table Houghton Athletic who have won just the once on the road all season. Other action comes at Stotfold Recreation Ground where sixth place Ickleford now losers of their last three home league starts look to repair the damage against the visiting fifth place AFC Kempston Town & Bedford College Reserves who have not won on the road since winning at Riseley Sports some five games ago and at Greenfield Road for third from bottom of the table Westoning the visitors are seventh place Shefford Town & Campton Reserves who are currently enjoying a five game unbeaten league run of which in four of those games the maximum points have been collected. Division Two action this weekend is restricted to just four games and for league leaders Cranfield United Reserves who are still unbeaten on the road this season in league action that means a trip to the Hockey Centre to take on eighth place Bedford United. Whilst second place Cople & Bedford SA who have been beaten just the once on the road this season it’s a trip to Marston Playing Fields to be hosted by second from bottom of the table Marston Shelton Rovers Reserves who are currently on a five game losing home run. Other action coming at the Football Centre where the hosting third place Flitwick Town Reserves seek out their seventh league win on the bounce against the visiting fifth place Atlectico Europa and at Cutler Hammer where the seventh place hosts Kempston Hammers Sports entertain sixth place Lea Sports PSG who will be looking to avoid their fourth consecutive away defeat. In Division Three league leaders Wixams travel to Horseshoes Close to face fifth place AFC Dunton who are currently on a four game winning home run knowing that the return of the maximum points would see them lift the seasons league title. Meantime over at Jubilee Playing Fields for fourth place Wilstead Reserves now on a seven game winning run it’s a visit from third place Caldecote Reserves who themselves are now unbeaten in their last 10 league outings of which nine have seen them collect the maximum points.Whilst just down the road at Rectory Road for the hosting ninth place Shefford Town & Campton A its the quest to avoid home defeat number three on the bounce when called upon by second from bottom of the table Meltis Albion Reserves whose last seven away outings have all ended in defeat. The final action coming in Mowsbury Park being the venue at which the hosting eighth place White Eagles losers of their last five league outings will be looking to return to winning ways when called upon by bottom of the table Clifton whose lone away win of the season came way back in September at Sandy Reserves. In Division Four the action is restricted to just two games. At Harvey Close where fifth place Caldecote A have been beaten just the once this season the visitors are third place Polonia Bedford who will be looking to avoid their third away defeat on the trot and watching this match with keen interest will be Mid Beds Tigers who with any result other than a home win will be crowned the 2015-16 season league champions. The second game being at Hillgrounds on the 3G surface where for sixth place AFC Kempston Town & Bedford College A now losers of their last three home league starts the visitors are seventh place Flitwick Town A who are unbeaten in their last five league outings.